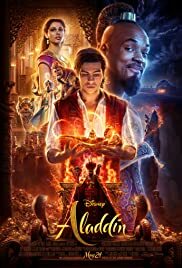 Director: Guy RitchieWriters: John August, Guy RitchieStars: Naomi Scott, Will Smith, Alan TudykSummary: A kindhearted Arabian street urchin and a power-hungry Grand Vizier vie for a magic lamp that has the power to make the deepest wishes come true. In October 2016, Disney announced Guy Ritchie would direct a live-action Aladdin remake. Smith was the first member of the cast to join, signing on to portray Genie in July 2017, and later that month Massoud and Scott were confirmed for the two lead roles. Principal photography began that September at Longcross Studios in Surrey, England, also filming in the Wadi Rum Desert in Jordan, and lasted until January 2018. Aladdin is scheduled to be theatrically released in the United States on May 24, 2019. It is set to be one of four live-action Disney animated features to be released in 2019, alongside Dumbo, The Lion King and Maleficent: Mistress of Evil. This entry was posted	on Thursday, April 4th, 2019 at 7:53 pm	and is filed under Family, Movie List, Movie Trailer, Movies, Trailers. You can follow any responses to this entry through the RSS 2.0 feed. You can leave a response, or trackback from your own site.